1. To have multiple network interface cards (NICs) on your computer and to assign a different IP address to each card. 2. To assign multiple IP addresses to a single NIC. 3. To combine 2 previous options: have multiple NICs with multiple IPs assigned to one or more of them. By default, each network interface card (NIC) has its own unique IP address. However, you can assign multiple IP addresses to a single NIC. 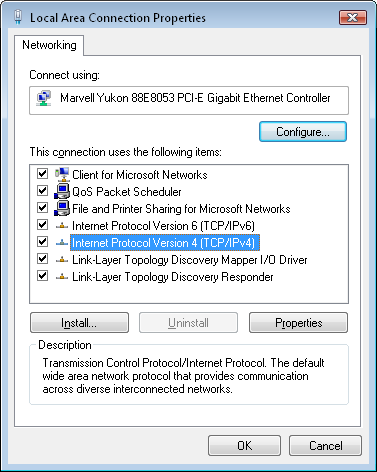 If you want to assign more than one IP address to a network card on Windows Vista, follow the steps below. 1. Choose Settings -> Network Connections on the Windows Start menu. 2. Right-click on the Local Area Connection, choose Properties. 3. Highlight Internet Protocol (TCP/IP), click Properties. 4. 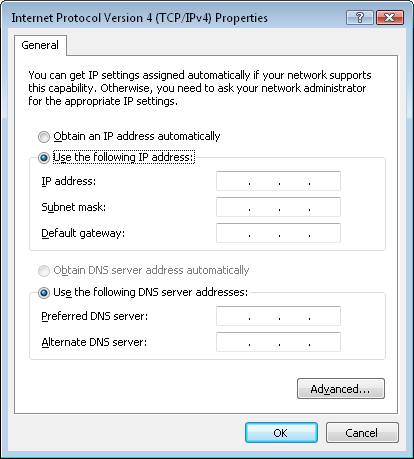 If you use DHCP, you should disable it: click Use the following IP address and enter IP address, Subnet mask and Default gateway. 5. Click Advanced... at the bottom. 6. Enter additional IP addresses: click the Add... button and enter a new IP address and Subnet mask.